Lunch: Tuesday-Sunday: 11:00am-4:00pm: Dinner: Monday-Thursday: 4:00pm-10:00pm, Friday-Saturday: 4:00pm -10:00pm: Sunday 11am-8pm Easter Buffet 2019 (please note: We will only be serving Brunch and are closed for dinner on 4/21) April 21st | 9am-3pm. $45.00 Adult Brunch Buffet, $15.00 Kids Buffet. Includes coffee tea and soda. House and Caesar Salad, Bagels and Cream Cheese, Deviled Eggs, Fresh Fruit, Smoked Salmon, House Smoked Trout, Cheese and Charcuterie, Chilled Shrimp Cocktail, Crab Claws, Oysters on the half shell. Scrambled Eggs, Eggs Benedict, Bacon, Sausage, Biscuits and Gravy, Breakfast Potatoes, Create your own made to order Omelet, Pancake Station, with your choice of toppings. Fried Chicken, Prime Rib Carving Station, Carved Bone In Honey Glazed Ham, Chicken Linguine, Fresh Catch, Baked Macaroni and Cheese, & more! Dessert Station Including Cheese cake, Macaroons. We offer guests a private parking lot. We like to think of Bishop's Post not only as casual fine dining restaurant, but as a casual fine dining experience. From our spacious two private dining rooms to our scenic patio and centerpiece stone fountain waterfall, to the cozy indoor fireplace. Bishop's Post has it all. Thinking about dinner plans but too tired to leave the house? 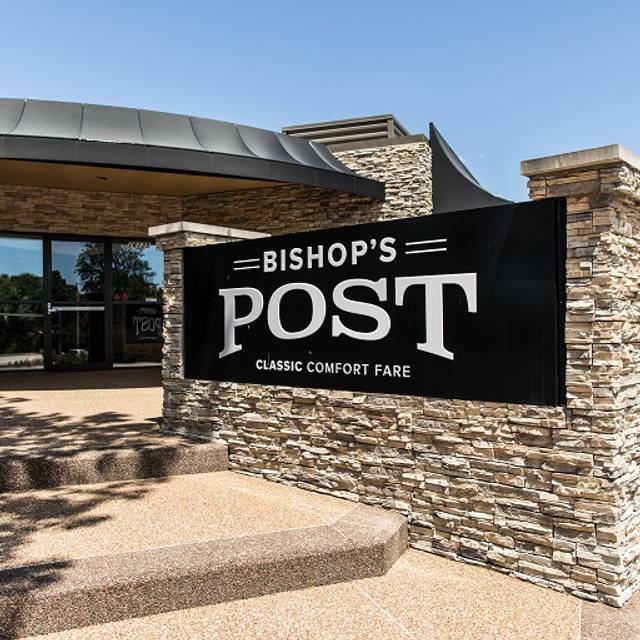 Bishop's Post will begin FREE delivery within a 5 mile radius beginning January 2019. Just give us a call to place your order! Outdoor seating area is first come, first serve. No reservations are accepted. Live music in the bar every Wednesday, Friday and Saturday! We had dinner with friends and Bishops Post is a must when we are back in town. Staff is great, Dan is a fantastic person and always has a great wine selection to choose from. We all had different menu items and all of us were vey happy with the meal. Prime Rib Special, Filet, Shrimp, Calamari. You won't be disappointed with your experience! The food was great. The only negative was that the noise level was so high that it was hard to carry on a conversation with those at our table. I can say my scallops were wonderful. Beautiful decor, fabulous patio!!!! Perfect for a date or any reason. Delicious food and friendly service. My wife and I had an impromptu dinner on a Wednesday night. The weather was nice, and we were seated on the patio. The live music was a little loud for my taste, but it did not interfere with conversation. I had the scallops, and she ordered the shrimp and grits. Both dishes were well executed. The scallops were perfectly cooked and delicious with a blend of sweet and salty flavors. The shrimp and grits came in a generous portion and the spicy seasoning brought a lot of flavor and ample, but not overwhelming, heat. It was a well-balanced dish. For dessert, we sampled the bread pudding. It's big enough for two to share and is served with ice cream and whipped cream. The texture and flavor are good. The dessert falls short of wowing us. The wait staff was friendly, well-trained, attentive and not overbearing. That's much appreciated. Always one of my favorite spots to relax and enjoy a good meal! Have never been disappointed with the food or the service. Great food and a wonderful patio! Bishop's Post continues to impress! My wife and I have been there several times and the menu keeps getting better in every way. The seafood special Lobster Gnocchi was one of the best meals in resent memory. I hope they put this as a regular menu item! Service was great! The restaurant provided us with a nice table with a table cloth in a room by ourselves. The problem was that it was very nice out and it was their first night with the patio open, so our quiet room became a passageway to the patio. Nonetheless, we had a vet nice time. Service was excellent and the food was very good. I highly recommend the restaurant and would go again. We ate outside it was a great setting. Because of season it got cold quickly so we finished our wine inside. Dinner was good. We both needed more salad dressing. My Ahi Tuna was a tad too done. But all in all a good experience. It was my husbands birthday dinner and the 7 of us had a great time! Service was excellent; friendly, fun and attentive. Food was excellent. Good win selection including a variety by the glass. A little pricey on the food so know that going in. Food and service were exceptional as well as great wines by the glass and atmosphere. We went for our wedding anniversary and it did not disappoint! The food at Bishop's Post was really amazing, as was the service. I had the prime rib special, which was as good as I've ever had. My wife had the veal picatta, which she absolutely loved, and she is a "particular" eater. The other couple's husband also had prime rib, which he raved about. As importantly, BP really went out of their way to accommodate his wife, who is severely allergic to MSG, shellfish and a host of other things. When he told our server, she went to the kitchen and they fired up a spare grill so her salmon would not be near any possible allergens. The ambiance was virtually unparalleled, as we had a view of the cascading waterfall that runs the entire length of a landscaped hill. Servers and a manager stopped by often to see if they could get anything for us. This was an outstanding culinary and serving experience. I highly recommend Bishop's Post. We will certainly be going again soon. great combination of delicious comfort food (meatloaf!! ), warm welcoming surroundings, and attentive (but not too attentive) service. Service was excellent. Food was good but not outstanding. Small serving sizes for the price. Once again Bishop’s Post delivers excellent service provided this time by Jamie and the food was delicious. My wife and I can’t get enough of this place. They have an amazing staff, as soon we have a favorite server we meet a new one. Management is always present and engages with patrons. Beautiful atmosphere great food. I can not wait until patio open up. Food was good for the money. Service was slow but it was Saturday evening. Dessert was good. Please work on the noise level. Everyone begins yelling to hear over the noise level which only makes it hard to have a conversation. We had a great meal during this visit. Food was excellent--my wife had the filet which was cooked perfectly and I enjoyed the "Post Roast", ie Pot Roast which was very tender and very tasty. General manager greeted us and made sure all went well and our service from Virginia was perfect. She is engaging, friendly and very efficient. One of our favorite places for great food and great service. They make us feel so welcomed and appreciate out business. Bishop's Post is one of our favorite restaurants in all of St. Louis. The food is delicious and we love the recent additions to the menu. They serve great comfort food like Pot roast and Fried Chicken and also offer wonderful "foodie" choices like the new Philly Steak Eggrolls which are crazy good. If you like happy hour or enjoy the bar scene, you'll love their amazing cocktails and half-off bottles of wine on Thursday. Vanna, Serena and Liz make us feel like family and, because of them, we've become "regulars". If the weather is nice, be sure to check out the patio which is definitely the best in the Midwest! Nina is absolutely delightful, compliments to the chef! I have stated before Bishop’s Post has become my home away from home. From the moment you walk in the door, the friendly greeting by the host to exceptional service, manager’s are always helping and engaging with tables and their staff. We really enjoyed the corned beef sliders on St. Pats Day and live music. The manager and the waitress were both wonderful. Have already recommended it to several people. Thank you Arthur for the great review. We appreciate the recommendations as well. Glad you had a great time, come back soon! Our waiter, Joel, was terrific. He made us feel like we mattered, that he truly cared - exactly what hospitality should be about. Dinner was delicious. I would order the Meatloaf & mashed potatoes again. Although the dining room was quite comfortable & attractive, we look forward to returning when the weather is suitable for al fresco dining. Their patio is gorgeous. Like an oasis, you forget you’re in the middle of Chesterfield. Hi, thank you for the wonderful review! We're glad you had a great experience at dinner and that Joel was a big part of that. It was our pleasure and we hope to serve you again soon. Thank you! Third visit to Bishop's Post and the food and service continued to not disappoint. However the price point has continually inched up, to the point that I'll have to think twice about whether to return -- especially if you like to have a cocktail or three with dinner. Drink prices and appetizers are now up there. Not sure how Open Table still lists it as a $30 price point restaurant. For example, the shrimp appetizer, though awesome, was $24 for four pieces of shrimp. Again, food was good, servers and bartenders were friendly.... Just be prepared to spend, especially if drinking adult beverages. Our server Virginia was the absolute best. I can’t say enough about how she made our night out the most pleasant we have had in years. We will be asking for her in the near future when we go back to Bishops Post. We love the fish specials. The chef is great as is our waitress. Nice place. great service by our waiter, very attentive. You must try the post roast it was delicious. Enjoyed every aspect! Thank you for the great review, we're very happy you enjoyed every aspect of your visit. Come back soon! This is a restaurant where you can feel comfortable with your friends, and know that the staff will be attentive to your every need. Their soup du jour, and wine list alone make it worth the visit. Their Patio opens on Saint Pats Sunday. We eat at Bishop’s Post often and the food and service are always wonderful — which is why we keep coming back! A very delightful dinning experience. Reservations were easy to make online. We gathered with friends from out of town that we hadn't seen in awhile. The service and food was outstanding. We had a rectangular table for 7 people. The only negative was that the table was so wide it was difficult to converse with the people across the table without yelling. So we were limited to talking to just the person next to us which wasn't great for catching up with the whole group. We had 3 separate conversations going on most of the night. Still, I would go back, but with a smaller group. Great place, food, service, ambiance.